KISS! THEY MIGHT BE INSANE! Probably the best (not! )Mego commercial jingle since Action Jackson launched the 1970’s fab four into vinyl and plastic that has Mego collectors and KISS Kollectors parting with lots and lots of green pictures of dead Presidents. Getting a MIB set of KISS figures today is almost as difficult as an up and coming toy company securing a license of a Rock and Roll Phenomena. In 1977, KISS was, in many respects, the most popular band in America (and other countries too, most notably, Japan) and their albums were shipping Platinum (that’s over a million copies sent to stores as it debuts, no easy feat). It was a year after a collaboration with Marvel Comics produced a KISS comic book that was Marvel’s best seller ever(it remained so until sometime in the eighties) and there live concerts were selling out all over the place. The KISS license was a real coup for Mego and they probably paid through the nose for it. The high cost of the license probably made them want to cut corners on the actual figures. In recalling the development phase of the dolls, Gene Simmons told about how Mego really didn’t want to do his figure with his trademark tongue sticking out. KISS had likeness approval on these figures so Gene was able to insist on it. Gene thought the tongue objection was due to the sexual connotations of sticking the tongue out. But the first prototypes provided more insight into Mego’s thinking. According to Gene, the prototypes all had the same heads EXCEPT for Gene, which had a sculpt with the tongue out. It was then Gene realized that out of economy, Mego wanted to use the same head for all four members and paint them accordingly. He believes the tongue objection came out of this. KISS vetoed the all for one head and sent Mego back to the drawing board. 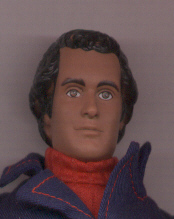 Mego came up with individual heads for each member that got approved. However, it turns out that one KISS member got a recycled head and that was Paul Stanley. Paul Stanley got the Captain’s head, from Mego’s Captain and Tennile figures. I wouldn’t be surprised if that was the head Mego wanted to use for all four members in the beginning. I’m sure there were plenty Captain heads hanging around the factory from a line that failed to be a hit. Luckily, the Captain’s features proved to be similar enough to Paul’s to allow Mego to unload the heads and/or save the cost of tooling at least one mold. The KISS figures’ costumes are based on the costumes that KISS wore from 1977-1979. These costumes are referred to as the “Love Gun Era” costumes (named after the album that the costumes premiered with). These are also the costumes that KISS recreated for their recent sell out reunion tour (making these figures all the more desirable for the long time and neophyte KISS fan). Here are more fun facts: KISS was first released on the skinny male bodies used for Sonny Bono, The Captain and other male figures. These are generally considered rarer than later issues on the more “Mego style” 12 and half-inch bodies. The TV commercial has all four on skinny bodies while the Mego catalog ad has only Ace on a skinny body (he is also missing his arm cuffs in the catalog ad). 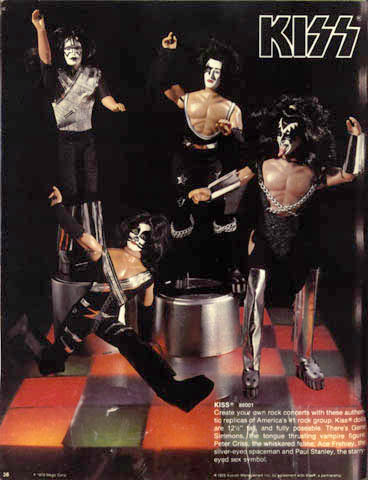 All four KISS figures had the same ankle high boots based on KISS’s platform shoes. These boots were molded in the needed color and had stencil painted details. The boots were put on underneath vinyl or foil leg cuffs to give the high boot look. Some KISS figures were released without any stencil painted details on the boots. Mego had shorter runs of Peter Criss because of unofficial rumors that he was leaving the band. 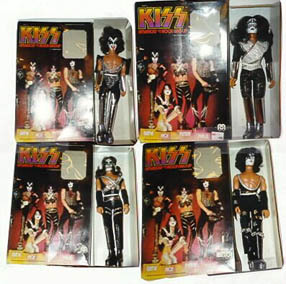 In fact, Peter did not leave the band until the KISS figures were well out of production in 1980 (he rejoined in 1996). It has been said some clever dealers placed the KISS dolls beside Diana Ross and Cher dolls (also by Mego) to capitalize on Gene Simmons’ romantic involvement with both women. It has also been said (this sounds silly and unlikely, but who knows? )that the band wanted to have printed or painted chest hair on the figures. They couldn’t demand it since likeness approval only covers the head. The KISS heads were molded in flesh color even though there would’ve been less to paint molding them in white. The figures were packed with small labels stuck to the boots advising the use of baby powder to help put boots on after taking them off. The band quickly nixed the terminology. Mego had only one box used for each of all four figures. The only identifying mark for the actual figure inside (beside the window box showing the face)was a small item number sticker put on the top left of the box front. The box insert was silver. Rather than producing intruments, the guitars and drums were printed on the box with instructions to cut them out. An article about the Reunion of KISS talks about a well-known band (though not well known enough for me to remember) playing a song “Used for the KISS dolls TV commercials back in the seventies”. At least one dealer specializing in KISS collectibles sells custom KISS dolls of later members in makeup: Eric Carr and Vinnie Vincent. Eric Carr is made from Paul Stanley figures, Vinnie Vincent from Ace figures.